Mr. Kellogg then introduced to the meeting the Hon. ABRAM [sic] LINCOLN, whig member of Congress from Illinois, a representative of free soil. MR. LINCOLN has a very tall and thin figure, with an intellectual face, showing a searching mind, and cool judgment. He spoke in a clear and cool, and very eloquent manner, for an hour and a half, carrying the audience with him in his able arguments and brilliant illustrations – only interrupted by warm and frequent applause. He began by expressing a real feeling of modesty in addressing an audience ‘this side of the mountains,’ a part of the country where, in the opinion of the people of his section, everybody was supposed to be instructed and wise. But he had devoted his attention to the question of the coming Presidential election, and was not unwilling to exchange with all whom he might meet the ideas to which he had arrived. He then began to show the fallacy of some of the arguments against Gen. Taylor, making his chief theme the fashionable statement of all those who oppose him, (‘the old Locofocos as well as the new’) that he has no principles, and that the whig party have abandoned their principles by adopting him as their candidate. He abandoned their principles by adopting him as their candidate. He maintained that Gen. Taylor occupied a high and unexceptionable whig ground, and took for his first instance and proof of this his whig ground, and took for his first instance and proof of this his statement in the Allison letter – with regard to the Bank, Tariff, Rivers and Harbors, &c.- that the will of the people should produce its own results, without Executive influence. The principle that the people should do what – under the constitution – they please, is a whig principle. All that Gen. Taylor does in not only to consent, but to appeal to the people to judge and act for themselves. And this was no new doctrine for Whigs. It was the ‘platform’ on which they had fought all their battles, the resistance of Executive influence, and the principle of enabling the people to frame the government according to their will. 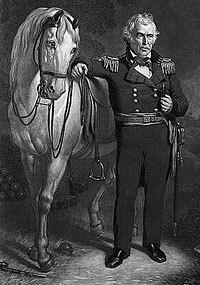 Gen. Taylor consents to be the candidate, and to assist the people to do what they think to be their duty, and think to be best in their natural affairs, but because he don’t want to tell what we ought to do, he is accused of having no principles. The Whigs here [have?] maintained for years that neither the influence, the duress, or the prohibition of the Executive should control the legitimately expressed will of the people; and now that on that very ground, Gen. Taylor says that he should use the power given him by the people to do, to the best of his judgment, the will of the people, he is accused of want of principle, and of inconsistency in position. Mr. Lincoln proceeded to examine the absurdity of an attempt to make a platform or creed for a national party, to all parts of which all must consent and agree, when it was clearly the intention and the true philosophy of our government, that in Congress all opinions and principles should be represented, and that when the wisdom of all had been compared and united, the will of the majority should be carried out. On this ground he conceived (and the audience seemed to go with him) that General Taylor held correct, sound republican principles. 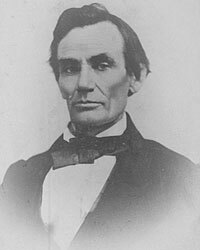 Mr. Lincoln then passed to the subject of slavery in the States, saying that the people of Illinois agreed entirely with the people of Massachusetts on this subject, except perhaps that they did not keep so constantly thinking about it. All agreed that slavery was an evil, but that we were not responsible for it and cannot affect it in States of this Union where we do not live. But, the question of the extension of slavery to new territories of this country, is a part of our responsibility and care, and is under our control. In opposition to this Mr. L. believed that the self named ‘Free Soil’ party, was far behind the Whigs. Both parties opposed the extension. As he understood it the new party had no principle except this opposition. If their platform held any other, it was in such a general way that it was like the pair of pantaloons the Yankee pedlar offered for sale, ‘large enough for any man, small enough for any boy.’ They therefore had taken a position calculated to break down their single important declared object. They were working for the election of either Gen. Cass or Gen. Taylor. Roy P. Basler, editor, The Collected Works of Abraham Lincoln, Volume I, p. 501 (Speech in the U.S. House of Representatives on the Presidential Question, July 27, 1848). Roy P. Basler, editor, The Collected Works of Abraham Lincoln, Volume I, p. 505 (Speech in the U.S. House of Representatives on the Presidential Question, July 27, 1848). Reinhard H. Luthin, The Real Abraham Lincoln, p. 106. Douglas L. Wilson and Rodney O. Davis, editor, Herndon’s Informants: Letters, Interviews and Statements about Abraham Lincoln, p. 689. Roy P. Basler, editor, The Collected Works of Abraham Lincoln, Volume II, p. 1-5 (September 12, 1848). Ida M. Tarbell, The Life of Abraham Lincoln, Volume I, p. 224. Reinhard H. Luthin, The Real Abraham Lincoln, p. 107.